The 23-year-old Germany international forward has struggled to make his mark during his two seasons at the Allianz Arena, but Guardiola still views the World Cup winner as a key member of his Bayern squad. The Spaniard told reporters: "Mario's got a contract here, he's my player and he's a great player too. In my mind, he is going to be a Bayern Munich player all season. In my mind, he is going to be a Bayern Munich player all season. "He's a top player, but I know that it's not only the coach who decides here. It depends on the club." Former Borussia Dortmund man Gotze had recently spoken of his admiration for Juve, telling Goal.com: "I think that Juventus reached the Champions League final not by chance, but because they had a great season last year. "They managed to win titles in the last year and they are a big, big club. But, at the moment, I don't want to comment because there's nothing to say - at the moment. "I'm just at the early stage of my career. Let's see what the future brings." 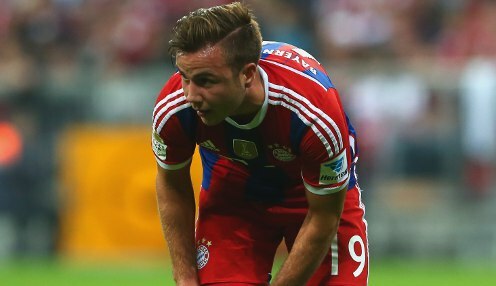 Last season Gotze scored 14 goals in all competitions for Bayern, helping them to win a third straight Bundesliga title. They are available at 1/1 to be crowned German champions again in 2015/16, with Wolfsburg 1/1 and Dortmund 1/1.